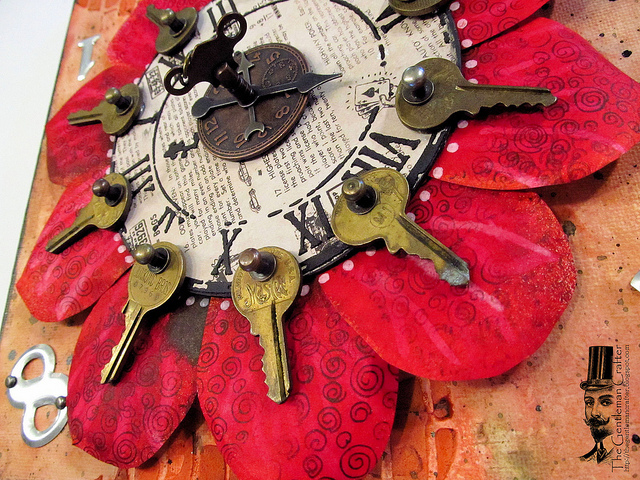 The Gentleman Crafter: The Clock Flower Canvas-Done! Well, Central Texas is rather chilly tonight. I had to grab a sweatshirt and turn off the ceiling fan for goodness sakes! It will be in the 80's later this week! Go figure...Good Old Texas Weather for ya! Have y'all finished your taxes yet? Can someone please tell me you haven't even if you have to lie about it? Ugggg! I think the thing that stops me is that I have to dig through about 6 piles of VERY IMPORTANT papers to find the ones I need! When I say piles...I mean piles like the anthills in Africa! BIG! But the weekend is coming and that is on my Weekend To Do List! I hope the ink and score tape that will find it's way onto these documents will not call attention to the auditors! LOL! Tonight For A Bit Of Stress Reduction....I finished up my Flower Canvas for Inspiration Emporium. Our cchallenge this month is stencils and masks. So, I pulled out a canvas, grabbed my Wendy Vecchi Embossing Paste and stenciled some bricks for a background... added some petals by spraying Dylusions Spray Inks through the Dylusions Christmas Trees Stencil for flower petals...Glued on some idea-ology and some keys and called it a day! 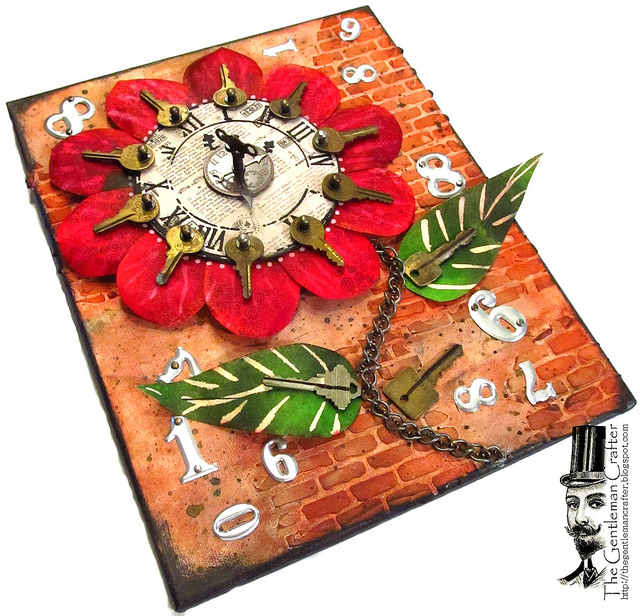 Wendy Vecchi Studio 490 Brick Wall Stencil can be found HERE! I love, love, love your canvas Jim. I love how you used the vintage keys with the bright colors on the canvas. Thansk Tons Shari! Thank God Barb Engleking sent that bag of keys! I have had so much fun with them! OMG Jim this is so neat! Love the keys and hitch fasteners... so creative ! Thanks So Much Rea! Got to love hitch fasteners connected to anything! LOL! Thanks again! J.
Amazing! I love this. You are so amazingly talented! Thank you so much! Too kind! Have an awesome night! J. Thanks Tons Janna! It was fun to make! And Fast too! :) Appreciate it! J.
Jim I DO NOT have my taxes done yet either & I really have no excuse. BTW love the canvas. Reminds me of a big happy sunflower. Jim, don't worry, I haven't done my personal or business taxes yet. I may even have to file for an extension this year. Feel better? I love the canvas...it's beautiful and so creative! So fun! Love the brick pattern and the tumbling numbers. I too am guilty of not having my taxes done. I guess that on our weekend to do list this weekend too. The canvas is amazing! It looks so artistic. Love the way you transform everyday objects! Wow....so fabulous, Jim. I love the textured background. The keys as numerals on the clock is so whimsical and fun. You never cease to amaze! I love the way your mind works! Jim you are a genius! I love your bright canvas and now need to get myself Wendy's brick wall stencil and some texture paste! Enjoy your weekend. I love every little detail! NICE JOB with the embossing paste & stencil! Isn't it amazing how imaginative your brain gets when we are avoiding something? Why we all fret about our taxes for 4 months is beyond me. Once they are done we feel gooood! I do it every year and wonder why I put myself through it. This canvas is so happy. I just might have to try a canvas.....it's canvas month at my local store. Perfect timing. I knew you would figure something out to do with them! This is outstanding. I have a huge smile on my face now and I may have to try this! Exacttly the genius project we have come to expect from you Jim! Great job, brilliant execution. wow! This is beautiful! And really different! wow...what a great work - love it! EEK...it is just about tax time, isn't it!!! I've had mine done for a month...well ALMOST done. I found some more deductions and have spent NO time adding them to the TurboTax. Guess I'd better get hopping...you too. Love the canvas...like Britgirl58 said...love how you describe putting things to gether...a bit of this, a bit of that and PRESTO...ART!!! 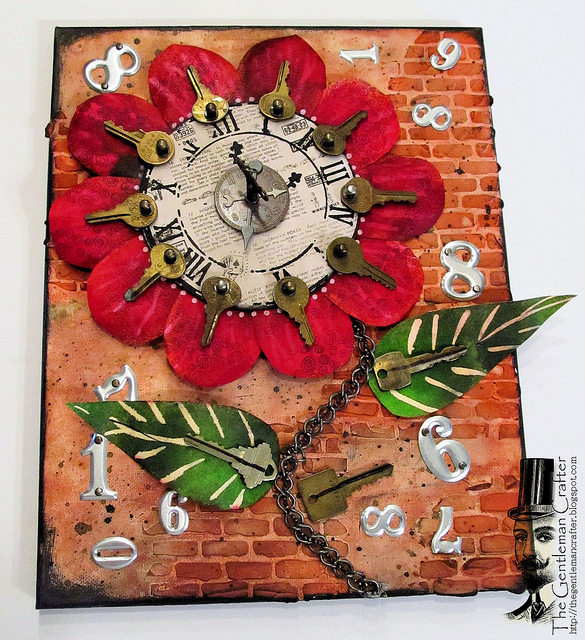 Love the entire piece...the brick wall is a perfect background for the flower clock that spewed it's numbers all over the canvas...so clever...as usual!! You must get tired of hearing it....YOU ROCK!!! This design is fabulous!!! You rocked the embossing paste and the clock is MAGNIFICENT!!!!! WOW! Do you know how totally talented you are? This is beyond cool, Jim. Are these the keys that were given to you as a gift? What a fabulous clock using them. To much talent stirs in that mind of yours!!!!!!!!! But we love it. I am so thankful that the hitch fastener is finally back. Don't know what they were thinking about when decided to retire them, even if they were having problems with their original supplier!! Just glad they are back and available now. Gorgeous! I can see this as a clock face, too! You have more fun than anybody! That's "too" as in "just like you did" and not "as well as!" Just sayin'! Wow Jim! I love your Flower Clock! Great piece of art! So beautiful! I hope you find a special place to display this! I have yet to try the paste, I must find some! Hope you get your taxes done, my hubby is doing ours (I always had an accountant do mine before getting married...I am too nervous to deal with that stuff...) Happy weekend! Love it! And no lie, I haven't completed my taxes. You are amazing !! I wait for your email to pour over all the details !Soon I am going to get up the nerve to try one. Love how you detail instructions. I had a small stroke several years ago so I am reteaching myself all the different processes. Keep up the beautiful work ! Absolutely stunning canvas. Beautifully vibrant and great embellies. Jim, I loved this and might try a canvas project. I loved how you used the embellishments. Wow! Love it! 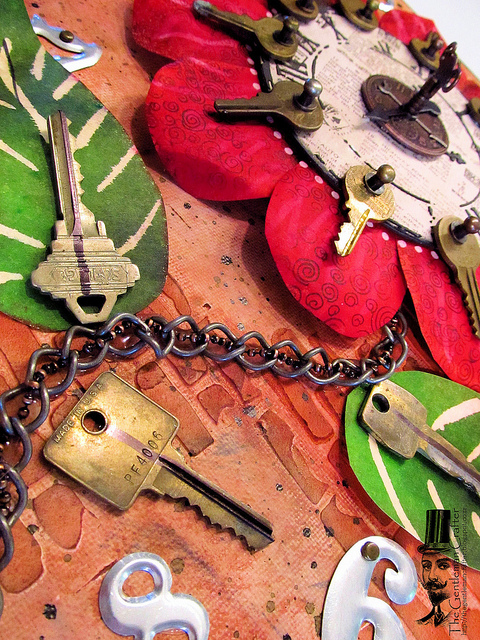 The colours are so bright & the use of the metal key embellishments is captivating. Beautiful canvas clock!! Love the bright colors!! I haven't done my taxes yet, either!! NO joke!! Oh my gosh, I love love LOVE the keys pointing into the petals. Can't wait to meet you Jim @ Ranger U! OMG! I love love LOVE it!!! Where did you get all the keys? Ok Jim don't hate me but the taxes are done and we are even getting a refund - YAHOO!!!! LOL --- I can't even remember when we last got a refund :-) I love how you used the Dylusion stencil to make the petal of the flower and using chain for the stem is PURE GENIUS!!!! OMG, Jim, this is fantastic! Love it so much and those keys would of never thought of that but would of been something my dad would of liked. He was a locksmith at one time. No idea if any keys are left or not. Been busy with my Mom, they gave her a few days to live on Monday and she is surprising them now. Beginning of the week it didn't look good at all, sometimes no response out of her and today a great big turn around. So I am sitting up late trying to catch up on my blogs I sub to. Mom would love it to as it was one of the things my dad was into. Anyway, thanks for sharing and brightening my day, it has been a long week. Forgot to ask, will you please do a class on this? I love your canvas!!! It is so unique and YOU!!! As for taxes... sorry we did ours right away in February, so it wouldn't be done at the last minute! I haven't got any of Wendy's Stencils yet... must add them to my wishlist!!! Have a fabulous weekend!!! "Hi" to Cesar also!!! Another fantastic project Jim. Just love this clock. It would be perfect out on my patio. You really rock!!! Love you canvas. Looks like a lot of fun to make. thanks as always for sharing. Well, not that anyone else has said as much, but this is so cooool!! My oldest granddaughter would LOVE this! Gonna have to CASE this if you don't mind?